Here's a little know fact about me: I took two Interior Design classes in college. I loved about 90% of it, after we got done talking about buttresses. I enjoyed nothing more than when we had to create a portfolio showcasing what we would like in our dream homes. Mine was especially problematic because I liked things from many styles that didn't always fit well together. Modern and Bauhaus furniture didn't always go so well with an Arts and Crafts type kitchen. My style has become more defined as the years progress and as the dream of one day owning a home becomes more palpable. So when I get gloomy or bored I spend a lot of time perusing interior design blogs, Pinterest (have I mentioned that lately? ha! ), and magazines. I have a whole Tumblr and 2 boards dedicated to spaces I love and things I want in my house. I love this kitchen. I'm a big fan of islands -- especially butcher block islands. And with the added storage on the bottom and the skylight above: perfection. I feel like the natural light opens up the room so much. Plus the lighted cupboards are a really great way for me to see my stuff, as well as incentive to clean and do dishes. Ha! How cool are these cabinets? I love that they slide out and they store all those little wonky-sized items. Plus it holds things you'd routinely use during cooking right next to the stove (which is a GORGEOUS stove). Laundry is hands-down my favorite chore. I love the idea of a little TV in there to pass the time while I fold and sort stuff. Especially because if I had a place specifically to fold it would likely be that way more often. I love photo walls. 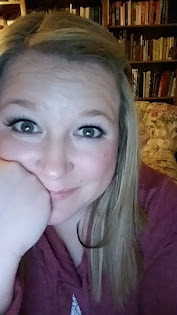 I have about 80 pinned/tumbl-ed. I just think they're a great way to showcase your life. I really like that this one follows the incline of the stairs. 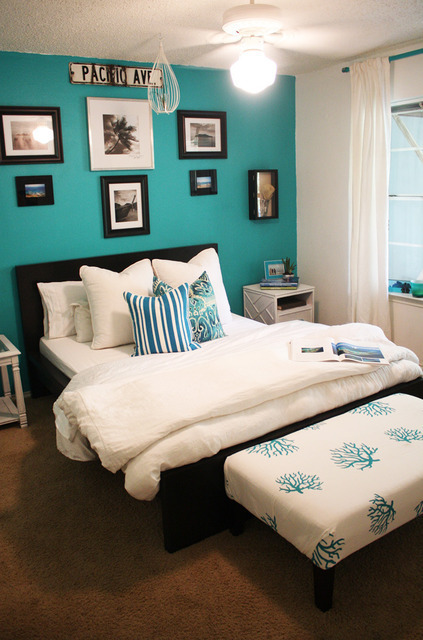 This teal color is my favorite color, but I could never do a white bedspread; I'm thinking gray, instead. I like that the wall color is echoed in the bar for the drapes. I also really love that the nightstands don't match, because I think it gives the room character. This is the couch of my dreams. Seriously check this bad boy out. 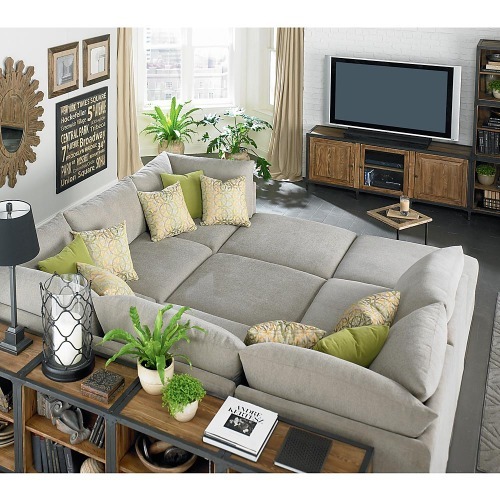 It's a sectional so it can be re-arranged in several ways, but can also be clumped together to create a super-couch.What better way to have family movie night than with a giant cuddle couch?! Do you ever faux-decorate your dream house? What does it look like? Laundry is hands down my favorite chore, too! I love, love, love doing laundry. I especially love folding and sorting to the accompaniment of a movie.